A cake made from four fantastic artisan cheeses from England, Ireland and Wales. To serve approximately 100 people. 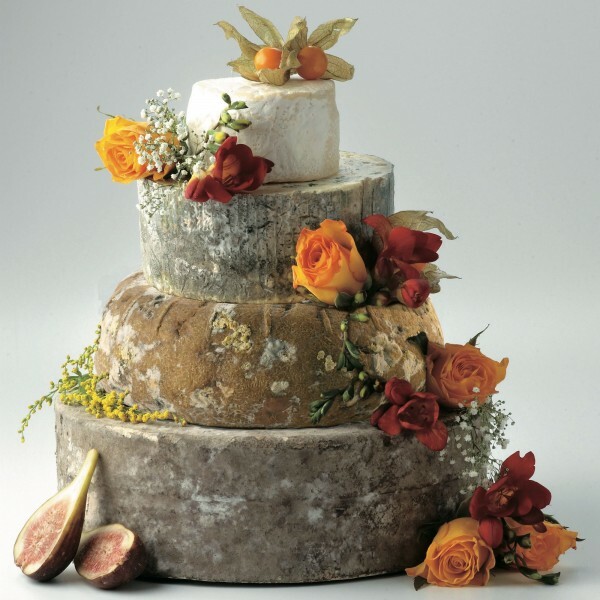 A cheese wedding cake to represent our Celtic connections - four truly outstanding cheeses. To serve approximately 100 people. Excellent as a centre piece at a wedding or indeed any celebration. The diameter of the base cheese (Caerphilly Gorwydd) is approximately 24cm. Finn min wt 200g x 6. A cows milk cheese with a soft, double cream texture. Lactic and creamy when young with walnut and mushroom flavours as it matures. Cashel Blue min wt 1.6kg. A mellow, subtle and creamy blue cheese handmade on a family farm in County Tipperary. Caerphilly Gorwydd min wt 4kg. A handmade Caerphilly with a distinct creamy outer layer near the rind and crumbly, citrus flavoured centre.